Mortgage Rates moved sideways to slightly lower for the 2nd day in a row, after hitting the highest levels in 5 months on Thursday. While the positive progress is better than a sharp stick in the eye, it nonetheless leaves us right in line with highs for all practical purposes. In fact, virtually all lenders are putting out quotes today that are indistinguishable from Thursday's for most prospective borrowers. The most prevalently-quoted conventional 30yr fixed rate remains 3.625% on top tier scenarios, with a handful of the most aggressive lenders at 3.5%. • At 10:00 AM ET, ISM Manufacturing Index for October. The consensus is for the ISM to be at 51.6, up from 51.5 in September. The ISM manufacturing index indicated expansion at 51.5% in September. The employment index was at 49.7%, and the new orders index was at 55.1%. • At 10:00 AM, Construction Spending for September. The consensus is for a 0.6% increase in construction spending. • All day: Light vehicle sales for October. The consensus is for light vehicle sales to decrease to 17.6 million SAAR in October, from 17.7 million in September (Seasonally Adjusted Annual Rate). The BEA has released the underlying details for the Q3 advance GDP report this morning. The BEA reported that investment in non-residential structures increased at a 5.4% annual pace in Q3. This is a turnaround from recent quarters when non-residential investment declined due to less investment in petroleum exploration. Investment in petroleum and natural gas exploration still declined in Q3, from a $47.1 billion annual rate in Q2 to a $42.2 billion annual rate in Q3 - and is down from $149 billion in Q3 2014 (down by more than two-thirds). Excluding petroleum, non-residential investment in structures increased at a 10% annual rate in Q3. Investment in offices increased in Q3, and is up 28% year-over-year -increasing from a very low level - and is now above the lows for previous recessions (as percent of GDP). Investment in multimerchandise shopping structures (malls) peaked in 2007 and was up year-over-year. The vacancy rate for malls is still very high, so investment will probably stay low for some time. Lodging investment increased further in Q3, and with the hotel occupancy rate near record levels, it is likely that hotel investment will increase further in the near future. Lodging investment is up 23% year-over-year. My guess is office and hotel investment growth will start to slow (office vacancies are still high, although hotel occupancy is near record levels). But investment growth has been very strong this year. Investment in single family structures was $237 billion (SAAR) (about 1.3% of GDP), and was down in Q3 compared to Q2, but is down slightly year-over-year. Investment in home improvement was at a $223 billion Seasonally Adjusted Annual Rate (SAAR) in Q2 (about 1.1% of GDP), and is up 9% year-over-year. The general business activity index has been negative for nearly two years, although it continued to push closer to positive territory in October, coming in at -1.5. It seems likely the ISM manufacturing index will show expansion again in October, and the consensus is for a reading of 51.6. Note that house prices are close to the bubble peak in nominal terms, but not in real terms (adjusted for inflation). Personal income increased $46.7 billion (0.3 percent) in September according to estimates released today by the Bureau of Economic Analysis ... Personal consumption expenditures (PCE) increased $61.0 billion (0.5 percent). Real PCE increased 0.3 percent. The PCE price index increased 0.2 percent. Excluding food and energy, the PCE price index increased 0.1 percent. On inflation: The PCE price index increased 1.2 percent year-over-year due to the sharp decline in oil prices (This was up from 1.0% year-over-year in August). The core PCE price index (excluding food and energy) increased 1.7 percent year-over-year in September (the same as in August). • "How do I protect myself if Trump is elected?" • At 8:30 AM ET, Personal Income and Outlays for September. The consensus is for a 0.4% increase in personal income, and for a 0.5% increase in personal spending. And for the Core PCE price index to increase 0.1%. • At 9:45 AM, the Chicago Purchasing Managers Index for October. The consensus is for a reading of 54.3, up from 54.2 in September. • At 10:30 AM, the Dallas Fed Survey of Manufacturing Activity for October. This is the last of the regional Fed surveys for October. Oil prices were down over the last week with WTI futures at $48.70 per barrel and Brent at $49.71 per barrel. A year ago, WTI was at $47, and Brent was at $48 - so oil prices are UP slightly year-over-year. Here is a graph from Gasbuddy.com for nationwide gasoline prices. Nationally prices are at $2.20 per gallon - a year ago prices were $2.18 per gallon - so gasoline prices are up slightly year-over-year. "How do I protect myself if Trump is elected?" Quite a few readers have asked me this question. My usual answer is that I expect Ms. Clinton to be elected President, and that the expansion will continue. "As our strategists have noted, the initial reaction to a potential Trump victory would likely be a risk-off event in the markets, which we think could end up delaying the Fed from hiking in December." That is just a guess at the short term reaction. The general rule is don't invest based on your political views. However policy does matter for investing and the economy. As an example, it was obvious to invest in oil when George W. Bush became President. And insurance companies like United Healthcare and Aetna seemed like good bets with a President Obama. Another example of policy is the deregulation of banks (and the anti-regulation attitude of the Bush administration) as part of the housing bubble story. But what about with Mr. Trump? He has said he'd "build a wall" along the border with Mexico, renegotiate all trade deals, cut taxes on high income earners, repeal Obamacare and more. But it is unclear what he'd actually do as President. As an example, no one really thinks a wall will be built along the entire border (maybe sections of a wall - and Mexico wouldn't pay for it). Repealing the ACA - without a replacement - would lead to many millions of Americans without health insurance. And those with preexisting conditions would be uninsurable. This seems politically unlikely (without a replacement policy), but if it happens, sell those health insurance companies. Right now it is hard to guess what policy would look like with Mr. Trump (Trump doesn't seem to understand policy issues - like his ignorant comments on the VAT while talking about trade with Mexico). One key concern with Trump is the potential for a trade war - and that could happen almost without warning. Long time readers remember when I used to write about the impact of policy (both good and bad), but there hasn't been much policy to discuss for the last few years. If Trump is elected, I'd expect a GOP sweep, and then I'll be writing frequently about policy again. Since Trump is at war with the data (he rejects data that doesn't fit his views), I don't expect evidence based policy proposals - and that almost always means bad results. Until we see the actual policy proposals, it is hard to predict the impact. I will not predict a recession just because Trump is elected, but I do think the economy would perform better under Clinton than Trump. Also, the words of a President matter. Mr Trump has been reckless and irresponsible with his comments, and that would probably continue. One absurd comment could send the markets into a tailspin (and that could happen at any time). That should make investors more cautious (as an example, I'm recommending that my home builder friends ease back on their spec building if Trump is elected). In conclusion: I expect Ms. Clinton to be elected and I'm currently taking no action to protect myself against the risks of a Trump presidency. The risks are real, but I think the odds of Trump winning are very low. If the unimaginable happens, I'll be writing about when to head to the bunker. Here is the unofficial problem bank list for October 2016. Update on the Unofficial Problem Bank List for October 2016. During the month, the list fell from 177 institutions to 173 after five removals and one addition. Assets dropped by $562 million to an aggregate $54.9 billion. A year ago, the list held 264 institutions with assets of $79.2 billion. Actions have been terminated against Horry County State Bank, Loris, SC ($383 million Ticker: HCFB) and Heritage Community Bank, Greeneville, TN ($89 million). Finding merger partners were Landmark Community Bank, National Association, Isanti, MN ($80 million); Citizens State Bank, Kingsland, GA ($56 million); and Home Savings Bank, Jefferson City, MO ($24 million). Added this month was The First National Bank of Lacon, Lacon, IL ($70 million). In a change, the OCC released an update on its enforcement action activity today, the last Friday of the month. Historically, the OCC has issued its update on the first Friday following the 15th of the month. While the FDIC provides a release on the last Friday of the month as well; however, it only includes action changes for the preceding month, so their information has a longer lag time. Conversely, the Federal Reserve releases individual action changes as they occur instead of waiting to accumulate them in a monthly release. Other key indicators include the October ISM manufacturing and non-manufacturing indexes, October auto sales, and the September trade deficit. 8:30 AM ET: Personal Income and Outlays for September. The consensus is for a 0.4% increase in personal income, and for a 0.5% increase in personal spending. And for the Core PCE price index to increase 0.1%. 9:45 AM: Chicago Purchasing Managers Index for October. The consensus is for a reading of 54.3, up from 54.2 in September. 10:30 AM: Dallas Fed Survey of Manufacturing Activity for October. This is the last of the regional Fed surveys for October. 10:00 AM: ISM Manufacturing Index for October. The consensus is for the ISM to be at 51.6, up from 51.5 in September. The ISM manufacturing index indicated expansion at 51.5% in September. The employment index was at 49.7%, and the new orders index was at 55.1%. 10:00 AM: Construction Spending for September. The consensus is for a 0.6% increase in construction spending. All day: Light vehicle sales for October. The consensus is for light vehicle sales to decrease to 17.6 million SAAR in October, from 17.7 million in September (Seasonally Adjusted Annual Rate). 8:15 AM: The ADP Employment Report for October. This report is for private payrolls only (no government). The consensus is for 170,000 payroll jobs added in October, up from 154,000 added in September. 8:30 AM ET: The initial weekly unemployment claims report will be released. The consensus is for 255 thousand initial claims, down from 258 thousand the previous week. 10:00 AM: Manufacturers' Shipments, Inventories and Orders (Factory Orders) for September. The consensus is a 0.2% increase in orders. 10:00 AM: the ISM non-Manufacturing Index for October. The consensus is for index to decrease to 56.1 from 57.1 in August. 8:30 AM: Employment Report for October. The consensus is for an increase of 178,000 non-farm payroll jobs added in October, up from the 156,000 non-farm payroll jobs added in September. In September, the year-over-year change was 2.45 million jobs. The consensus is for the U.S. trade deficit to be at $38.9 billion in September from $40.7 billion in August. Fannie Mae reported today that the Single-Family Serious Delinquency rate was at 1.24% in September, unchanged from 1.24% in August. The serious delinquency rate is down from 1.59% in September 2015. The Fannie Mae serious delinquency rate has fallen 0.35 percentage points over the last year, and at that rate of improvement, the serious delinquency rate will not be below 1% for about 8 more months. Residential investment (RI) decreased at a 6.2% annual rate in Q3. Equipment investment decreased at a 2.7% annual rate, and investment in non-residential structures increased at a 5.4% annual rate. On a 3 quarter trailing average basis, RI (red) is unchanged, equipment (green) is slightly negative, and nonresidential structures (blue) is slightly positive. I expect investment to pick up going forward, and for the economy to grow at a steady pace. The third graph shows non-residential investment in structures, equipment and "intellectual property products". Investment in equipment - as a percent of GDP - has declined a little recently.. Investment in nonresidential structures - as a percent of GDP - had been moving down due to less investment in energy and power, and is now moving sideways. Still no worries - residential investment will pickup (still very low), and non-residential will also pickup. • To keep markets on notice for a possible rate hike in December, we expect the statement to indicate that the committee is considering action “at its next meeting”—although this is a close call. The statement will likely again say that risks to the economic outlook are “roughly balanced”. • A statement along these lines should keep the committee on track to raise the funds rate at the December meeting. We see a 75% chance of an increase, roughly in line with market expectations. The remaining uncertainty relates to incoming economic data and financial conditions ... conditional on decent data and stable markets, a December rate hike looks very likely. CR note: The next FOMC meeting is next week, on November 1st and 2nd and it seems very unlikely there will be a change in policy at this meeting. The final University of Michigan consumer sentiment index for October was at 87.2, down from the preliminary estimate of 87.9, and down from 91.2 in September. The Sentiment Index slipped in October to the same low recorded last September and to the lowest level since October 2014. The October decline was due to less favorable prospects for the national economy, with half of all consumers anticipating an economic downturn sometime in the next five years for the first time since October 2014. Objectively, the probability of a downturn during the next five years is far from zero-this would be the longest expansion in 150 years if it lasted just over half of the five year horizon. Nonetheless, the October rise may simply reflect a temporary bout of uncertainty caused by the election. Real gross domestic product increased at an annual rate of 2.9 percent in the third quarter of 2016, according to the "advance" estimate released by the Bureau of Economic Analysis. In the second quarter, real GDP increased 1.4 percent. he increase in real GDP in the third quarter reflected positive contributions from personal consumption expenditures (PCE), exports, private inventory investment, federal government spending, and nonresidential fixed investment that were partly offset by negative contributions from residential fixed investment and state and local government spending. Imports, which are a subtraction in the calculation of GDP, increased. The acceleration in real GDP growth in the third quarter reflected an upturn in private inventory investment, an acceleration in exports, a smaller decrease in state and local government spending, and an upturn in federal government spending. These were partly offset by a smaller increase in PCE, and a larger increase in imports. The advance Q1 GDP report, with 2.9% annualized growth, was above expectations of a 2.5% increase. Personal consumption expenditures (PCE) increased at a 2.1% annualized rate in Q3, down from 4.3% in Q2. Residential investment (RI) decreased at a 6.2% pace. Equipment investment decreased at a 2.7% annualized rate, and investment in non-residential structures increased at a 5.4% pace. Our final Q3 GDP tracking estimate stands at +2.9% (qoq ar), roughly in line with the consensus of forecasts that were updated after the September trade report. We look for a strong boost from net exports, solid consumer spending, a small contribution from capital expenditures, and another (albeit smaller) drag from inventories. • At 8:30 AM ET, Gross Domestic Product, 3rd quarter 2016 (Advance estimate). The consensus is that real GDP increased 2.5% annualized in Q3. • At 10:00 AM, University of Michigan's Consumer sentiment index (final for October). The consensus is for a reading of 88.5, up from the preliminary reading 87.9. Freddie Mac reported that the Single-Family serious delinquency rate declined in September to 1.02%, down from 1.03% in August. Freddie's rate is down from 1.41% in September 2015. The Freddie Mac serious delinquency rate has fallen 0.39 percentage points over the last year, and at that rate of improvement, the serious delinquency rate could be below 1% next month (October). The Census Bureau released the Residential Vacancies and Homeownership report for Q3 2016. The Red dots are the decennial Census homeownership rates for April 1st 1990, 2000 and 2010. The HVS homeownership rate increased to 63.5% in Q3, from 62.9% in Q2. The HVS homeowner vacancy was unchanged at 1.8% in Q2. The rental vacancy rate increased to 6.8% in Q2. I think the Reis quarterly survey (large apartment owners only in selected cities) is a much better measure of the rental vacancy rate - and the Reis survey is showing rental vacancy rates have started to increase slightly. The Federal Reserve Bank of Kansas City released the October Manufacturing Survey today. According to Chad Wilkerson, vice president and economist at the Federal Reserve Bank of Kansas City, the survey revealed that Tenth District manufacturing activity expanded again at a moderate pace. The Kansas City region was hit hard by the decline in oil prices, and it appears activity is starting to expand again. Pending home sales shifted higher in September following August's notable dip and are now at their fifth highest level over the past year, according to the National Association of Realtors®. Increases in the South and West outgained declines in the Northeast and Midwest. The Pending Home Sales Index, a forward-looking indicator based on contract signings, grew 1.5 percent to 110.0 in September from a slight downward revision of 108.4 in August. With last month's gain, the index is now 2.4 percent higher than last September (107.4) and has now risen year-over-year for 22 of the last 25 months. The PHSI in the Northeast fell 1.6 percent to 96.5 in September, but is still 7.7 percent above a year ago. In the Midwest the index declined modestly (0.2 percent) to 104.6 in September, and is now 1.0 percent lower than September 2015. Pending home sales in the South rose 1.9 percent to an index of 122.1 in September and are now 1.7 percent higher than last September. The index in the West jumped 4.7 percent in September to 107.3, and is now 4.0 percent above a year ago. This was above expectations of a 1.0% increase for this index. Note: Contract signings usually lead sales by about 45 to 60 days, so this would usually be for closed sales in October and November. In the week ending October 22, the advance figure for seasonally adjusted initial claims was 258,000, a decrease of 3,000 from the previous week's revised level. The previous week's level was revised up by 1,000 from 260,000 to 261,000. The 4-week moving average was 253,000, an increase of 1,000 from the previous week's revised average. The previous week's average was revised up by 250 from 251,750 to 252,000. There were no special factors impacting this week's initial claims. This marks 86 consecutive weeks of initial claims below 300,000, the longest streak since 1970. The dashed line on the graph is the current 4-week average. The four-week average of weekly unemployment claims increased to 253,000. • At 8:30 AM ET, the initial weekly unemployment claims report will be released. The consensus is for 255 thousand initial claims, down from 260 thousand the previous week. Note: I expect some further impact on claims due to Hurricane Matthew. • Also at 8:30 AM, Durable Goods Orders for September from the Census Bureau. The consensus is for a 0.2% increase in durable goods orders. • At 10:00 AM, Pending Home Sales Index for September. The consensus is for a 1.0% increase in the index. • Also at 10:00 AM, the Q3 Housing Vacancies and Homeownership from the Census Bureau. • At 11:00 AM, the Kansas City Fed Survey of Manufacturing Activity for October. The Federal Reserve Bank of Philadelphia has released the coincident indexes for the 50 states for September 2016. In the past month, the indexes increased in 36 states, decreased in 11, and remained stable in three, for a one-month diffusion index of 50. Over the past three months, the indexes increased in 40 states, decreased in nine, and remained stable in one, for a three-month diffusion index of 62. Eight states have seen declines over the last 6 months, in order the five worst are Wyoming (worst), Alaska, Louisiana, Kansas, Oklahoma - mostly due to the decline in oil prices. The Case-Shiller house price indexes for August were released yesterday. Zillow forecasts Case-Shiller a month early, and I like to check the Zillow forecasts since they have been pretty close. According to Zillow’s September Case-Shiller forecast, the national index and both smaller 10 and 20-city indices look set to continue the acceleration in home price growth they exhibited in August. And after more than two years of steady growth around 5 percent annually, the U.S. National Case-Shiller home price index is within striking distance of reaching its July 2006 peak levels, just 0.1 percent off those levels, according to today’s data. The September Case-Shiller National Index is expected to grow 5.4 percent year-over-year and 0.7 percent month-to-month (seasonally adjusted). We expect the 10-City Index to grow 4.3 percent year-over-year and 0.3 percent (SA) from July. The 20-City Index is expected to grow 5.1 percent between September 2015 and September 2016, and rise 0.4 percent (SA) from August. 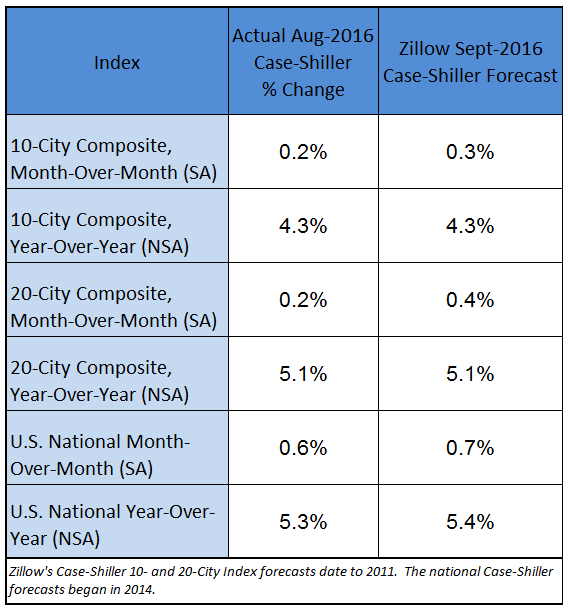 Zillow’s September Case-Shiller forecast is shown in the table below. 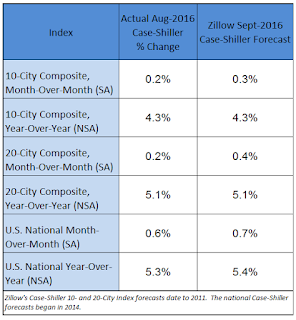 These forecasts are based on today’s August Case-Shiller data release and the September 2016 Zillow Home Value Index (ZHVI). The September S&P CoreLogic Case-Shiller Indices will not be officially released until Tuesday, November 29. The year-over-year change for the 10-city and 20-city indexes will probably be about the same in the September report as in the August report. The change for the National index will probably be slightly higher. New home sales for September were reported below the consensus forecast at 593,000 on a seasonally adjusted annual rate basis (SAAR). And the three previous months were all revised down significantly. However, sales were up 29.8% year-over-year in September, and this is the best month for September (NSA) since 2007. And sales are up 13.0% year-to-date compared to the same period in 2015. The glass is more than half full. This is very solid year-over-year growth. Earlier: New Home Sales at 593,000 Annual Rate in September. This graph shows new home sales for 2015 and 2016 by month (Seasonally Adjusted Annual Rate). Sales to date are up 13.0% year-over-year, because of very strong year-over-year growth over the last six months. Overall I expected lower growth this year, in the 4% to 8% range. Slower growth seemed likely this year because Houston (and other oil producing areas) will have a problem this year. It looks like I was too pessimistic on new home sales this year. The "distressing gap" graph shows existing home sales (left axis) and new home sales (right axis) through September 2016. This graph starts in 1994, but the relationship had been fairly steady back to the '60s. The Census Bureau reports New Home Sales in September were at a seasonally adjusted annual rate (SAAR) of 593 thousand. The previous three months were revised down by a total of 85 thousand (SAAR). "Sales of new single-family houses in September 2016 were at a seasonally adjusted annual rate of 593,000, according to estimates released jointly today by the U.S. Census Bureau and the Department of Housing and Urban Development. This is 3.1 percent above the revised August rate of 575,000 and is 29.8 percent above the September 2015 estimate of 457,000. " The months of supply decreased in September to 4.8 months. "The seasonally adjusted estimate of new houses for sale at the end of September was 235,000. This represents a supply of 4.8 months at the current sales rate." In September 2016 (red column), 50 thousand new homes were sold (NSA). Last year 35 thousand homes were sold in September. This was below expectations of 600,000 sales SAAR in September. I'll have more later today. Mortgage applications decreased 4.1 percent from one week earlier, according to data from the Mortgage Bankers Association’s (MBA) Weekly Mortgage Applications Survey for the week ending October 21, 2016. The prior week’s results included an adjustment for the Columbus Day holiday. ... The Refinance Index decreased 2 percent from the previous week to its lowest level since June 2016. The seasonally adjusted Purchase Index decreased 7 percent from one week earlier to its lowest level since January 2016. The unadjusted Purchase Index increased 3 percent compared with the previous week and was 9 percent higher than the same week one year ago. The average contract interest rate for 30-year fixed-rate mortgages with conforming loan balances ($417,000 or less) decreased to 3.71 percent from 3.73 percent, with points increasing to 0.37 from 0.36 (including the origination fee) for 80 percent loan-to-value ratio (LTV) loans. Refinance activity increased this year since rates declined, however, since rates are up a little recently, refinance activity has declined a little. The purchase index was "9 percent higher than the same week one year ago". Mortgage Rates were unchanged in many cases today, with a handful of lenders inconsequentially better or worse versus yesterday's latest offerings [at 3.55% for 30 year fixed]. Despite moving lower on 4 out of the past 6 days, rates were never able to put meaningful distance between themselves and the highest levels in more than 4 months. • At 10:00 AM, New Home Sales for September from the Census Bureau. The consensus is for a decrease in sales to 600 thousand Seasonally Adjusted Annual Rate (SAAR) in September from 609 thousand in August. The Chemical Activity Barometer (CAB), a leading economic indicator created by the American Chemistry Council (ACC), notched another solid gain of 0.3 percent in October, following an upwardly revised gain of 0.4 percent in September. Accounting for adjustments, the CAB is up 4.2 percent over this time last year, a marked increase over earlier comparisons and the greatest year-over-year gain since August 2014. All data is measured on a three-month moving average (3MMA). On an unadjusted basis the CAB climbed 0.3 percent in October, following a 0.4 percent gain in September. Currently CAB has increased solidly over the last several months, and this suggests an increase in Industrial Production over the next year. The year-over-year increase in prices is mostly moving sideways now around 5%. In August, the index was up 5.3% YoY. It has been almost ten years since the bubble peak. In the Case-Shiller release this morning, the National Index was reported as being only 1.6% below the bubble peak (seasonally adjusted). However, in real terms, the National index is still about 16.2% below the bubble peak. The first graph shows the monthly Case-Shiller National Index SA, the monthly Case-Shiller Composite 20 SA, and the CoreLogic House Price Indexes (through August) in nominal terms as reported. In nominal terms, the Case-Shiller National index (SA) is back to December 2005 levels, and the Case-Shiller Composite 20 Index (SA) is back to June 2005 levels, and the CoreLogic index (NSA) is back to August 2005. In real terms, the National index is back to February 2004 levels, the Composite 20 index is back to October 2003, and the CoreLogic index back to January 2004. On a price-to-rent basis, the Case-Shiller National index is back to August 2003 levels, the Composite 20 index is back to April 2003 levels, and the CoreLogic index is back to July 2003. The S&P CoreLogic Case-Shiller U.S. National Home Price NSA Index, covering all nine U.S. census divisions, reported a 5.3% annual gain in August, up from 5.0% last month. The 10-City Composite posted a 4.3% annual increase, up from 4.1% the previous month. The 20-City Composite reported a year-over-year gain of 5.1%, up from 5.0% in July. Before seasonal adjustment, the National Index posted a month-over-month gain of 0.5% in August. Both the 10-City Composite and the 20-City Composite posted a 0.4% increase in August. After seasonal adjustment, the National Index recorded a 0.6% month-over-month increase, and both the 10-City Composite and the 20-City Composite reported 0.2% month-over-month increases. After seasonal adjustment, 14 cities saw prices rise, two cities were unchanged, and four cities experienced negative monthly prices changes. The Composite 10 index is off 10.9% from the peak, and up 0.2% in August (SA). The Composite 20 index is off 8.9% from the peak, and up 0.2% (SA) in August. The National index is off 1.6% from the peak (SA), and up 0.6% (SA) in August. The National index is up 33.0% from the post-bubble low set in December 2011 (SA). The Composite 10 SA is up 4.3% compared to August 2015. According to Black Knight's First Look report for September, the percent of loans delinquent increased slightly in September compared to August, and declined 12.2% year-over-year. The percent of loans in the foreclosure process declined 3.4% in September and were down 31.2% over the last year. Black Knight reported the U.S. mortgage delinquency rate (loans 30 or more days past due, but not in foreclosure) was 4.27% in September, up from 4.24% in August. The percent of loans in the foreclosure process declined in September to 1.00%. The number of delinquent properties, but not in foreclosure, is down 292,000 properties year-over-year, and the number of properties in the foreclosure process is down 228,000 properties year-over-year. Black Knight will release the complete mortgage monitor for September on November 7th. Economist Tom Lawler sent me the table below of short sales, foreclosures and all cash sales for selected cities in September. On distressed: Total "distressed" share is down year-over-year in most of these markets. Short sales and foreclosures are down in most of these areas. Travel on all roads and streets changed by 3.4% (9.3 billion vehicle miles) for August 2016 as compared with August 2015. Travel for the month is estimated to be 284.9 billion vehicle miles. The seasonally adjusted vehicle miles traveled for August 2016 is 268.6 billion miles, a 2.5% (6.5 billion vehicle miles) increase over August 2015. It also represents a 0.8% decrease (-2.2 billion vehicle miles) compared with July 2016. Miles driven (rolling 12) had been below the previous peak for 85 months - an all time record - before reaching a new high for miles driven in January 2015. The second graph shows the year-over-year change from the same month in the previous year. Miles driven are up 3.4% year-over-year. In August 2016, gasoline averaged $2.28 per gallon according to the EIA. That was down from August 2015 when prices averaged $2.73 per gallon. Gasoline prices aren't the only factor - demographics are also important. However, with lower gasoline prices, miles driven on a rolling 12 month basis, is setting a new high each month. WSJ: "Retailers Rushed to Hire for Holidays"
Retailers geared up to hire holiday-season workers in August this year, an unusually early start showing how competition has intensified for temporary help in a tight labor market. Data from job-search site Indeed.com shows retailers, and the warehouse and logistics firms they compete with for seasonal labor, started searching for temporary workers a month earlier than in recent years. This suggests retailers and other firms “anticipate stronger consumer demand and expect that it will be harder to find the people they want to hire,” said Indeed economist Jed Kolko. This graph really shows the collapse in retail hiring in 2008. Since then seasonal hiring has increased back close to more normal levels. Note that retailers have been hiring earlier with more seasonal hires in October (red). Based on the information in the WSJ article, it appears seasonal hiring will be at record levels in October this year. • At 8:30 AM ET, the Chicago Fed National Activity Index for September. This is a composite index of other data. Oil prices were mixed over the last week with WTI futures at $50.67 per barrel and Brent at $51.61 per barrel. A year ago, WTI was at $44, and Brent was at $47 - so oil prices are UP about 10% to 15% year-over-year. Here is a graph from Gasbuddy.com for nationwide gasoline prices. Nationally prices are at $2.21 per gallon (close to unchanged from a year ago). Gasoline prices will be up year-over-year soon. The automakers will report October vehicle sales on Tuesday, November 1st. Note: There were 26 selling days in October 2016, down from 28 in October 2015. A WardsAuto forecast calls for October U.S. light-vehicle sales to reach a 17.8 million-unit seasonally adjusted annual rate, making it the seventh month this year to surpass 17 million. A 17.8 million SAAR is greatly higher than the 17.3 million recorded year-to-date through September, but does not beat the 18.1 million result recorded in the same month last year. The SAAR for total sales is projected at 17.7 million units in October 2016, down from 18.1 million units a year ago. The dashed line is the September sales rate. Sales for 2016 - through the first nine months - were up slightly from the comparable period last year. After increasing significantly for several years following the financial crisis, auto sales are now mostly moving sideways. The key economic reports this week are the advance estimate of Q3 GDP and September New Home Sales. Also the Case-Shiller House Price Index for August will be released. For manufacturing, the October Richmond and Kansas City Fed manufacturing surveys will be released this week. 9:00 AM: FHFA House Price Index for August 2016. This was originally a GSE only repeat sales, however there is also an expanded index. The consensus is for a 0.5% month-to-month increase for this index. 9:00 AM ET: S&P/Case-Shiller House Price Index for August. Although this is the August report, it is really a 3 month average of June, July and August prices. This graph shows the nominal seasonally adjusted National Index, Composite 10 and Composite 20 indexes through the July 2016 report (the Composite 20 was started in January 2000). The consensus is for a 5.1% year-over-year increase in the Comp 20 index for August. The Zillow forecast is for the National Index to increase 5.2% year-over-year in August. The consensus is for an decrease in sales to 600 thousand Seasonally Adjusted Annual Rate (SAAR) in September from 609 thousand in August. 8:30 AM ET: The initial weekly unemployment claims report will be released. The consensus is for 255 thousand initial claims, down from 260 thousand the previous week. Note: I expect some further impact on claims due to Hurricane Matthew. 8:30 AM: Durable Goods Orders for September from the Census Bureau. The consensus is for a 0.2% increase in durable goods orders. 10:00 AM: Pending Home Sales Index for September. The consensus is for a 1.0% increase in the index. 11:00 AM: Kansas City Fed Survey of Manufacturing Activity for October. 8:30 AM ET: Gross Domestic Product, 3rd quarter 2016 (Advance estimate). The consensus is that real GDP increased 2.5% annualized in Q3. 10:00 AM: University of Michigan's Consumer sentiment index (final for October). The consensus is for a reading of 88.5, up from the preliminary reading 87.9. "The Structural Factors Behind the Steady Fall in Labor Force Participation Rates of Prime Age Workers"
Dr. Lysy discusses the various reasons for the decline (disability, "Mr. 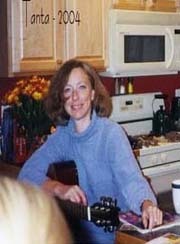 Mom", more prime workers in school, etc. ).